In July 1628, Thomas Hobson, a local carrier, donated land to representatives of the town and University for the erection of a workhouse and a house of correction or bridewell, to be completed within a period of four years. The building, which became known as the Spinning House, was "pleasantly situated near the fields at the south end of the parish of Great St Andrew's" (Stokes, 1911) — on what became St Andrew's Street. Part of the building was used to imprison vagrants and beggars who were employed in such tasks as beating hemp. Stocks of wool, flax and other materials were also kept on the premises for providing employment for unemployed textile workers who were not resident in the workhouse. However, the main use of the establishment became "the confinement of such lewd women as the proctors apprehend in houses of ill fame; though sometimes the Corporation send small offenders thither, and the crier of the town is often there to discipline the ladies of pleasure with his whip." Cambridge Town Bridewell, Samuel Barker Keeper, is a square building surrounded by a boundary-wall of 15 feet high and about 5 feet from the prison; was originally bought and endowed for the encouragement of wool-combers and spinners of this town. The basis of the institution was a legacy of the famous carrier Thomas Hobson, who died in 1630. To answer the intention, the keeper is a wool-comber. He employs not only several hands upon the foundation of the charity, but many others: among them his prisoners. His salary is paid out of the charity, 301. and from the University 51. Allowance, town prisoners, 6d. a day. The vice-chancellor's prisoners have 4d. a day and 6d. on Sunday; they are likewise allowed fireing in the winter. Each cell has a mattress, two blankets, and a rug. For men there are three cells at the entrance, each 9 feet by 7½, and near 8 feet high, with straw on the floor. A tub serves the purpose of a necessary in these cells. They are ventilated by an iron grating over each door which has an aperture about 6 inches square. For women there are ten cells, the same size as the men's, and four court-yards with a privy in each. There is only one pump in the prison. Many of the cells are out of repair, and the whole prison very dirty. ...the principal use to which the building had been applied was a receptacle for profligate and disorderly women, &c., committed by the vice-chancellor, their maintenance being paid by the University. It is also used for the reception of persons sent by the Mendicity Society of Cambridge so long as it existed; and vagrants not belonging to the town or university were sent there, relieved and discharged. Those committed by the mayor and magistrates were kept there for one night, and forwarded to their parishes in the morning, the expense of their maintenance being paid out of the town rates. Since 1807, the house has been wholly used for these purposes, and the inmates are allowed to remain there in a state of complete idleness." Large sums of money were expended in 1812 and in 1821 in repairing and enlarging the buildings. After 1838, the premises were used as the borough police station. It was demolished in 1901. 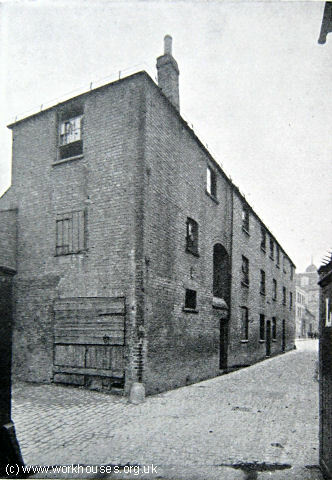 All Saints parish workhouse stood in a yard at the rear of 38 Sidney Street. Its date of founding is unknown but is known to have existed by 1773 (Stokes, 1911). However, the establishment is absent from the 1777 parliamentary survey. Until 1807, able-bodied paupers were employed by the parish at a rope-walk in a close in Jesus Lane. In the same year, a Mr John Walker was contracted to farm the parish poor in the workhouse for the weekly sum of 4s. per head, for which he provided board, washing, mending, fire and candles. Walker also received the income from the inmates' labour. The workhouse rules demanded that all inmates were "to attend Church every Sunday except for one who is left at home to take care of the House." By 1824, the workhouse building had fallen into disrepair but was subsequently repaired and enlarged. When auctioned in 1838, the building was described as "a brick and slate dwelling house, with 8 rooms, and a kitchen under; with a yard and shed; situated in Sidney Street." St Andrew's the Great established a workhouse in 1756 in some rented tenements (Stokes, 1911) and in the 1777 parliamentary survey, the parish was reported as having a workhouse for 20 inmates. 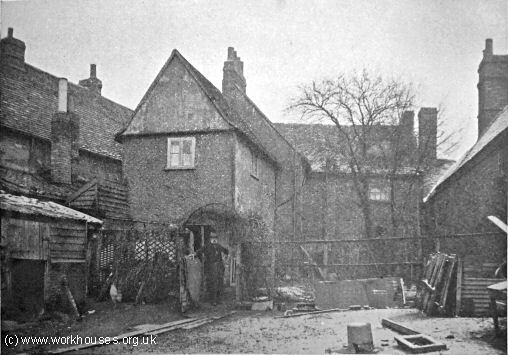 Various plans to erecting a new workhouse were made but not implemented until 1829 when a building was erected in St Tibb's Row, St Andrew's Hill, next to the cattle market, and with a large frontage in the Red Lion Yard. Constructed from brick and slate, it contained "a sitting room, a large hall, a back kitchen, a good cellar, a yard, a pump of good water, and 12 good bedrooms." St Andrew's the Great workhouse. Here is a list of the poorhouse rules dating from 1813. Great St Andrews, August 2nd, 1813. At a Vestry Meeting held this day, it was the unanimous opinion that the following Rules be printed and put up in the Poor House. That all persons in the house obey the Master and Mistress or Assistant in all proper commands. That they be diligent at their work. That they work from seven O'Clock in the morning until seven O'Clock in the evening in Winter — and from six O'Clock in the morning, 'till six O'Clock in the evening in Summer. That they be allowed half an hour at breakfast, and an hour at dinner. That they do not go out without leave, nor permitted to stay longer than the time appointed them. That they clean themselves before breakfast on Sunday mornings and go in time to Church in a regular and decent manner. All who conduct themselves properly shall be paid one Half of their earnings as a reward for their industry. That every person shall be in the house by eight O'Clock in the evening from Michaelmas to Lady day — and nine O'Clock in the evening from Lady day to Michaelmas. The building was sold off in October 1838 and converted to a house, but was later acquired by Jesus and Emmanuel Colleges. The workhouse for the parish of St Andrew's the Less stood at the end of the north side of is now Norfolk Street, formerly Workhouse Lane. The date of its origin is uncertain but in 1838 it was described as having been erected "a few years since". An adjacent piece of ground contained the parish gravel pit. 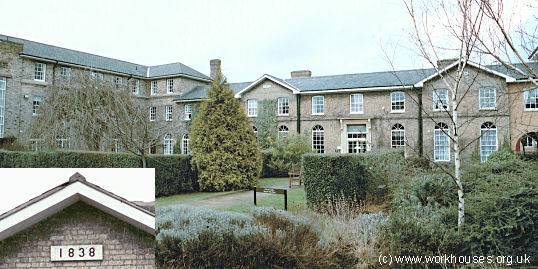 Following the creation of the Cambridge poor law union in 1836, the St Andrew's the Less workhouse was temporarily used to accommodate children, up to about 46 in number. St Andrew's the Less workhouse. The building survived into the twentieth century as 8-9 Staffordshire Gardens. St Benedict's had a parish workhouse from around 1736 in a cul-de-sac known as Prime's Court off Trumpington Street, a little to the south of Addenbrooke's Hospital. By the mid-1770s, it could house up to 15 paupers. From 1823, St Benedict's hired a part of the workhouse of St Andrew's the Less on what is now Staffordshire Gardens. The parish of St Botolph (sometimes spelled St Bottolph) established a workhouse in about 1733 but its location is unknown. By the mid-1770s, it could accommodate up to ten inmates. Below is an inventory of the goods in the St Botolph's workhouse taken in 1747. Two Elbow Chairs; Six Rush Bottom Chairs; Two Tables; One Lookeing Glass; Fire Irons and a Fender; A wicker cloaths Baskett; One picture. Two Chairs; One Table; One Stool; Six wheels; One Reel; One Cricett [low wooden stool] One Salt Box; Fire Irons; A Pooker; Two Fire Shovells; Two pair of Bellows; One Fryeng pan; A pewter Dish; One wooden Dish; Three Iron Candlesticks; Four pint Muggs and half pint Mugg; A Towell Rowl; A Looking Glass; A Large Sawspan and Lid. One Copper and a wooden Lid; A Livery cubbard; A Fryeng pan; Fire Irons and Large Standards; A Large Gridiron; A Brass Kettle and wooden Lid; A Small Sawspan and Iron pott; Three earthen Dishes and Two pangs; Three wheels; One wooden Bowl and one platter; Eight wooden Dishes; Fourteen Spoons; One Ladle and Thirteen Trenchers; Four Wash Troughs; A Half Mess Dish and Two pewter plates; A Spade and a coal Tubb; One chair; Two pails; One Brush. One Feather Bed one Pillow; One Bedstead one Matt; Standards and Bars; One Chair. A Feather Bed, one Boulster, Two pillors; Three Blanketts, and one Cover Lid; A Bedstead and Curtins; Window Curtins; Five Curtin Rods in the Closett; Three pair of Sheets, one pillow beer One Looking glass, one warming pan; A Fire Grate and a Pair of Tongs; A chest of Draws; A Nest of Draws; Seven chairs; One Table. One Feather Bed one Bowlster; One pillow, Two Blanketts, one Rugg; A Bedstead and Two white Curtins; Two Tables, one Stool; Another Bedstead; One Straw Bed and a coverlid in the Closett; Two Candle Sticks; A hair Broom. Two Feather Beds, Three Bowlsters; One Bedstead, Two Coverlids; One Sheet, Two Matts Two Chairs, one Table, one Trunk; One window curtin, one Rod. Three Feather Beds, Three Bowlsters; Three sheets, Three Blanketts; Three Coverlids; Three Bedsteads, A Sett of Curtins; Three Chairs, one Looking Glass, seven Chamber potts. One Beer Stall, one Filter, one Baskett. In 1806, a building was hired from Mr Beales in Black Lion Yard. 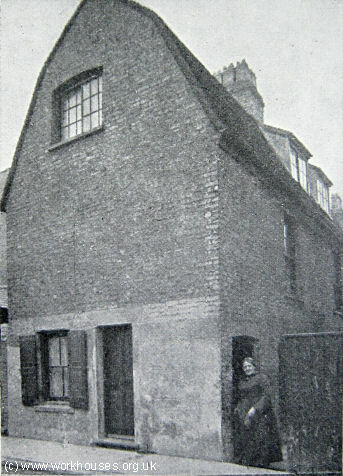 A little later, a house at the north-east corner of St Botolph's churchyard was rented from Corpus Christi College although this was demolished to make way for the college's New Court. Between 1824 and 1836, St Botolph paid £20 a year to send up to ten of its paupers (excluding lunatics or infectious cases) to the St Giles's workhouse. The payment was subsequently reduced to £16 a year although certain special supplementary payments were made such as 6s.6d. a quarter to a barber for shaving at the workhouse. Up to the end of the eighteenth century, St Clement's appears to have had several "poor houses" or "parish houses". However, by at least 1799, a workhouse had been established on the south side of Castle Street opposite to the castle. The parish poor rate books include many interesting entries. In 1809, "Pd. for a Comb for the Poor... 3d." is the only record of such an expenditure. Two years later, "Pd. for Rat Poison... 1l. 1s. 0d." suggests a relatively large-scale rodent problem on the premises. The parish's rather mercenary approach to keeping its poor rate down is indicated by the 1826 entry "Pd. Hannah Molyneux her marriage fees by which we got rid of her... 5s." A similar entry in 1829 records "Marriage Present and Fees to Widow Arnold by which we got rid of her being in the family way... 4l. 14s. 6d." After the formation of the Cambridge poor law union in 1836, the building was eventually acquired by St John's College. In 1733, a proposal was made for St Edward's to run a workhouse jointly with St Mary the Less although it is not clear whether this was carried out. The parish of St Edward had a workhouse in operation from at least 1735, probably in rented premises attached to the Physic or Botanic Garden. In 1746, the sum of 1s. was paid for "nailing the Vine at the Workhouse." By the 1770s, the workhouse could accommodate up to 13 paupers. In 1786, the parish was given notice to quit the property. In order to provide a replacement, it raised funds to buy and refurbish two tenements on Slaughterhouse Lane (later renamed Corn Exchange Street). As was the common practice, the employment given to inmates of the St Edward's workhouse included spinning — a 1787 inventory mentions three spinning wheels, one reel, one small wheel, etc. In 1799, following complaints that one of the paupers named Isaac Smith was "deranged in his Intellects", a secure room was erected in the workhouse yard for his confinement. In 1836, the St Edward's workhouse was initially used by the new Chesterton union to house able-bodied men of whom around a dozen were employed in working a mill — the mill was later transferred to the new union workhouse on Mill Road. After the opening of the union workhouse, the old St Edward's workhouse premises were let until being demolished to make way for new University medical schools at the west side of Corn Exchange Street. By the 1770s, St Giles had a parish workhouse accommodating up to twenty inmates. 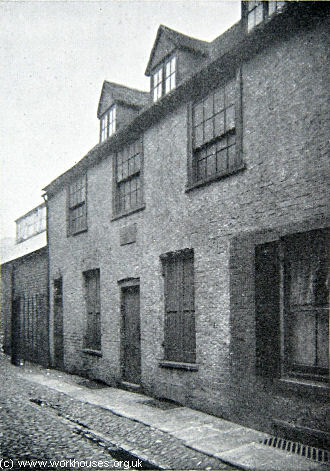 From at least the early 1800s, the workhouse premises were in Bell Lane (now Northampton Street). They comprised six cottages, three at the front — later converted to an inn known as the Borough Boy — and three in a Court. St Giles's the Great workhouse. St Giles — Cambridge's sole surviving parish workhouse building. St Mary the Great set up a workhouse in 1734 when it leased the house of Mr Edward Holladay at the eastern side of Slaughterhouse Lane (now Corn Exchange Street). The lease was renewed in 1756 and again in 1777 then purchased by the parish in 1793. The Vestry books of the parish record that in 1761 William Enderby was contracted to farm the workhouse inmates for the sum of 1s. 8d. per head per week — increased in 1769 to 3s. per head. In 1821, the mistress of the workhouse was a Mrs Smith who was paid an annual salary of eight guineas. A year later, it was deemed "expedient that there be a Man and Woman to manage the House, at which point Mrs Smith had to vacate her position. She was succeeded by a Mr (and Mrs?) Burrows, but he was given notice to quit in 1827 and succeeded by William Freeman. Freeman remained Governor until early in 1836 when a fatal fracas took place in the workhouse. The minutes note that "Mr Freeman was dismissed, and Charles Bleet was ordered to be indicted for the murder or manslaughter of Thomas Chickley lately an inmate." Freeman was replaced by George and Lydia James until May 1836 when the new Cambridge and Chesterton unions began operating. The Chesterton union tried, unsuccessfully, to hire the St Mary's building until its new union workhouse was erected. It was then sold by auction to Mr Benjamin Bridges for the sum of £703 10s. 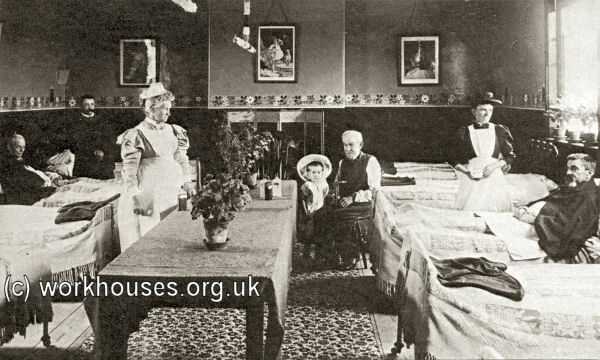 Little evidence survives about the workhouses employed by St Mary's the Less. In March 1733, the parish agreed to operating a joint workhouse with St Edward's but it is unclear whether or not this actually took place. The 1777 parliamentary survey of poor relief noted that St Mary's had a workhouse with accommodation for up to ten paupers. Local tradition has it that a workhouse stood on Little St Mary's Lane in a court called Banks's Alley adjacent to a pub named All Around My Hat. The parish minutes do, however, record that in 1816, St Mary's the Less joined with Holy Sepulchre to run a workhouse at a site on the east side of Staffordshire Place (now Staffordshire Street) running back 276 feet to Albert Street (now Young Street). This establishment continued in use until the creation of the new Cambridge and Chesterton poor law unions in 1836 when it was used temporarily to house around a dozen sick and infirm paupers. St Michael's, the smallest of Cambridge's old parishes, gained its workhouse through the 1744 legacy of Mrs Ann Carrow. 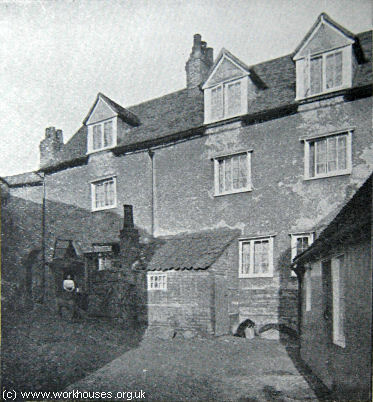 The money was invested in two tenements in Gifford's Place, off Green Street, with the parish subsequently being given the option of turning them into almshouses. The tenements were rebuilt in 1794 for the use of the most distressed paupers belonging to the parish. St Peter's appears to have had a workhouse on Shelley Row, opposite Albion Row. The buildings were leased from the town corporation. In the 1770s, the workhouse could house up to eight inmates. Extensive Leasehold Estate, in Castle Street. Lot 1. House on the Pound Hill, with large yard at back and gardens; bounded on the east by a passage leading to Castle Street, and on the west by Pound Hill, &c. Lot 2. Two gardens with an entrance from Castle End. Held by Lease from the Corporation for 40 years from Michaelmas 1823 at £2 2s. 0d., and land tax 8s. During the eighteenth century, the poor of Holy Sepulchre benefited from a bequest made in 1710 by Mr James Lowry. Part of the income from this charity was used for renting five cottages at the back of the Round Church to act as a workhouse. In 1813, the parish gave up these tenements and two years later paid £60 for part of the Geldart estate in Barnwell on which a workhouse was erected. The site had a forty-foot frontage on Staffordshire Place (now Staffordshire Street) running back 276 feet to Albert Street (now Young Street). In 1816, the parish of St Mary the Less paid Holy Sepulchre for a share in the premises. In 1836, after the creation of the Cambridge and Chesterton poor law unions, the workhouse was used for a few years to house around a dozen sick and infirm paupers. In the mid-1770s, Holy Trinity had a parish workhouse which could house up to 24 paupers. By the early 1800s, it was renting poorhouse premises from Corpus Christi College although their location is unknown. On April 30th 1826, Vestry minutes record that "Mr Alderman Coe referred to a poor lunatic confined in an outhouse with shoes or stockings. Upon Mr Farish seeing the lunatic he expressed his opinion that his legs and feet would mortify." The workhouse governor, named Allum, was thereupon dismissed and John White appointed in his place. In 1828, a new workhouse was erected in White Hart Yard (later Trinity Place) at the south side of King Street. In 1830, the parish acquired half an acre of ground where some of the inmates were employed in digging gravel. Some also worked in the parish churchyard. The workhouse was strictly run: inmates were not allowed visitors without written orders, although they could (with written medical consent) take exercise on Christ's College Piece between 11am and noon, and between 5pm and 6pm. The overseers were always eager to remove inmates from parish support — on one occasion they paid £40 to enable a pauper family to emigrate to New York. A riot is said to have taken place in the parish in 1834 after the death of a pauper on out-relief. His body was supposed to have been taken to the workhouse in White hart Yard but was actually conveyed to the Medical School's Rotunda building in Downing Street. When this became known, the "Round House" was mobbed and several rioters arrested. However, the pauper's body was retrieved and given a decent burial. 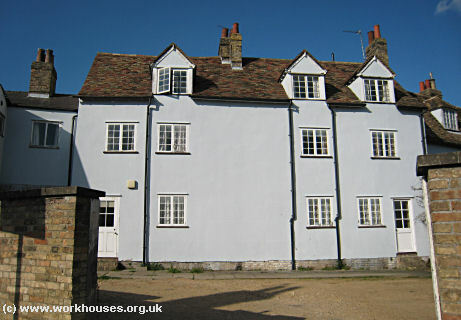 Following the creation of the Cambridge and Chesterton poor law unions in 1836, the workhouse was used for a while to house around thirty aged males. Town of Cambridge: All Saints (2), Holy Trinity (2), St Andrew-the-Great (2), St Andrew-the-Less (4), St Benedict (2), St Botolph (2), St Clements (2), St Edward (2), St Giles (2), St Mary-the-Great (2), St Mary-the-Less (2), St Michael (2), St Peter (2), St Sepulchre. The population falling within the union at the 1831 census had been 20,917 — ranging from St Sepulchre (population 674) to St Andrew-the-Less (6,651). The average annual poor-rate expenditure for the period 1833-35 had been £9,907 or 9s.6d. per head. As noted above, the able-bodied men at St Edward's were employed in working a mill and other labours. 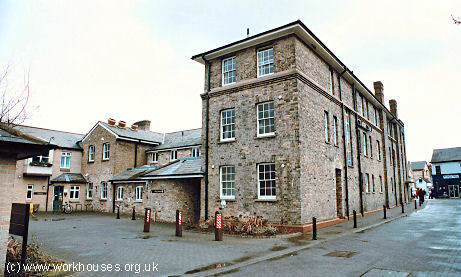 The mill was subsequently transferred to the new union workhouse. 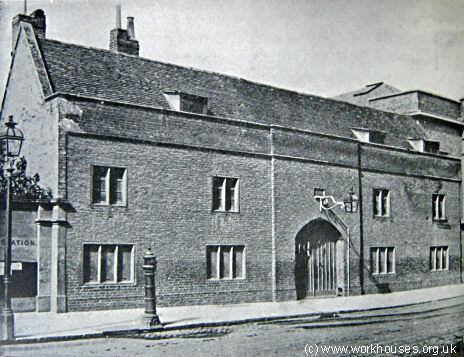 Cambridge union workhouse site, 1888. 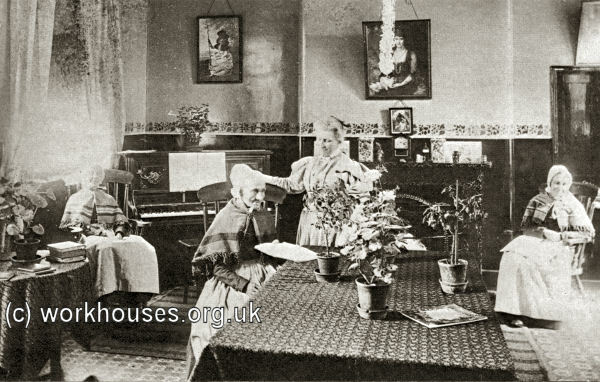 Cambridge workhouse elderly women's day room, c.1880s. Cambridge workhouse men's infirm ward, c.1880s. Boys' and girls' schools were located at each side of the entrance block, with a chapel (perhaps also used as a dining-hall) at the west of the centre range. Male and female infirmaries stood at the north of the site. Cambridge entrance block from the south, 2001. Cambridge entrance block from the north-west, 2001. After 1930, it became Cambridge Infirmary, and later Mill Road Maternity Hospital. Douglas Adams, author of The Hitchhiker's Guide to the Galaxy , was born there on March 11th, 1952. The rear buildings were replaced by a housing development in 1989. In around 1915, the union established a children's home at 138 Ross Street, Cambridge. The building no longer exists. Cambridge Archives and Local Studies, Box SH 1009, Shire Hall, Castle Hill, Cambridge CB3 0AP. Holdings include: Births (1866-1935); Deaths (1877-1938); Punishment book (1842-98); Guardians' minutes (1836-1930); etc. Barclay-Munro, B. and Cook, H.E. (1991) Workhouse to Housework: the Long and Varied History of a much loved Cambridge building (Cambridge City Council). Stokes, H.P. (1911) Cambridge Parish Workhouses Proceedings of the Cambridge Antiquarian. Society Vol. XV.